For many design firms, the ability to offer and maintain competitive employee benefit programs continues to be one of the keys to attracting and retaining the best available talent. Yet, the regulatory and legal environment within which these benefit plans are being designed and administered is more complex than ever. Not only are there ERISA issues, but there is a literal alphabet soup of COBRA, FMLA, HIPAA, etc. 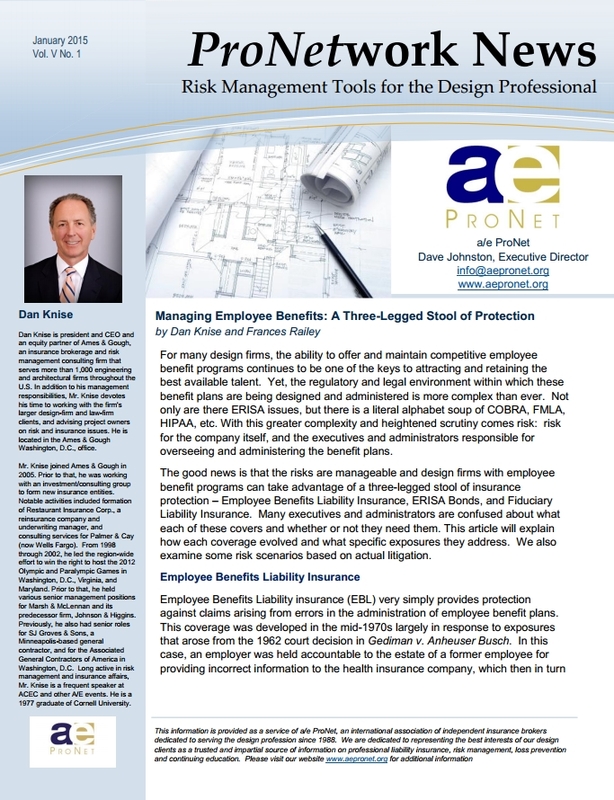 With this greater complexity and heightened scrutiny comes risk: risk for the company itself, and the executives and administrators responsible for overseeing and administering the benefit plans. 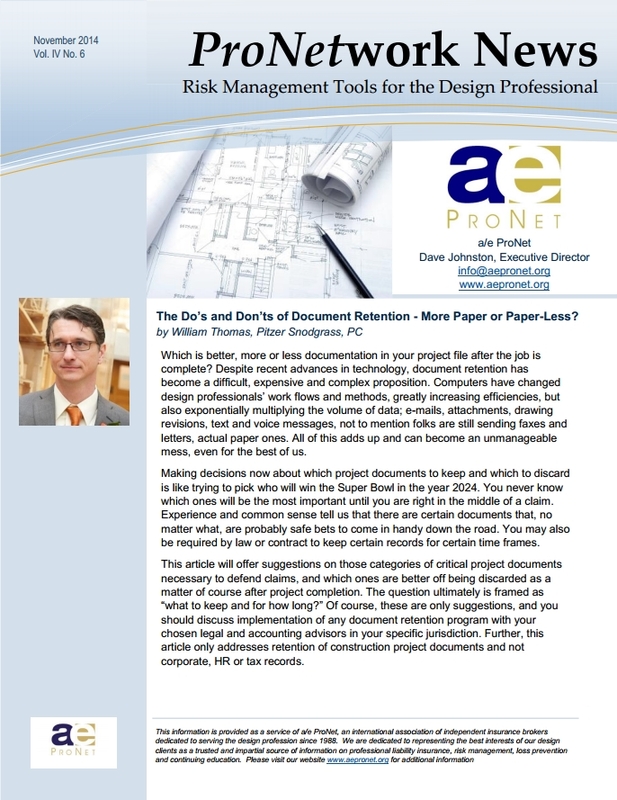 The Do’s and Don’ts of Document Retention – More Paper or Paper-Less? 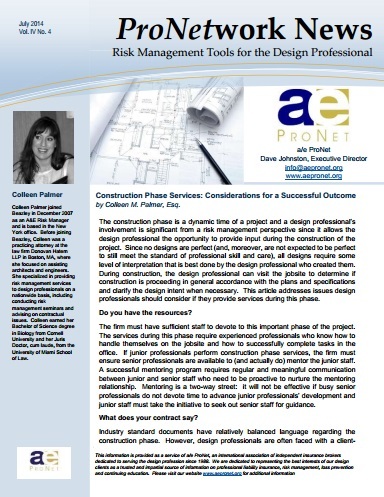 The construction phase is a dynamic time of a project and a design professional’s involvement is significant from a risk management perspective since it allows the design professional the opportunity to provide input during the construction of the project. Since no designs are perfect (and, moreover, are not expected to be perfect to still meet the standard of professional skill and care), all designs require some level of interpretation that is best done by the design professional who created them. During construction, the design professional can visit the jobsite to determine if construction is proceeding in general accordance with the plans and specifications and clarify the design intent when necessary. 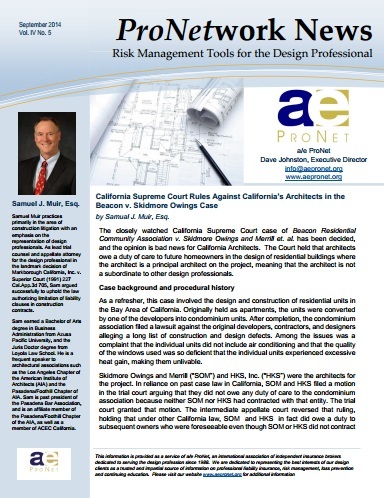 This article addresses issues design professionals should consider if they provide services during this phase. 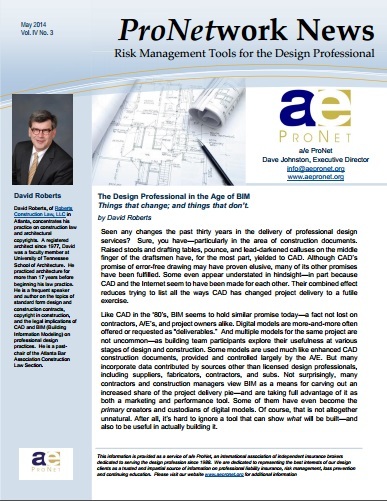 The Design Professional in the Age of BIM: Things that change; and things that don’t. Seen any changes the past thirty years in the delivery of professional design services? Sure, you have—particularly in the area of construction documents. Raised stools and drafting tables, pounce, and lead-darkened calluses on the middle finger of the draftsmen have, for the most part, yielded to CAD. Although CAD’s promise of error-free drawing may have proven elusive, many of its other promises have been fulfilled. Some even appear understated in hindsight—in part because CAD and the Internet seem to have been made for each other. Their combined effect reduces trying to list all the ways CAD has changed project delivery to a futile exercise. Like CAD in the ‘80’s, BIM seems to hold similar promise today—a fact not lost on contractors, A/E’s, and project owners alike.